Hiring a professional mover can save you time and money in the long run, because if anything goes wrong, you can make a claim. We professionally secure your items with furniture pads and ensure that every single piece of item is placed in a box to prevent damage. Take it from us, we’ve seen a thing or two. When it comes to moving your household, it’s never without its challenges, especially when trying to find the moving company that’s right for you. We say you must first know your objectives and that’s where we come in – professionals to help you identify and achieve those objectives. A technician will come to your house and do an inventory of every item to be moved. 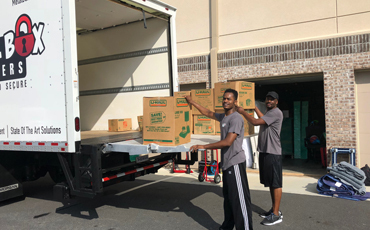 We will supply up to five men with a truck, along with all the necessary supplies and tools (boxes not included) to ensure a safe and reliable relocation to your new home. Our technicians are trained to pack and they have a vast knowledge when it comes to the different boxes and their purposes. Leave it to us and we’ll take the guesswork out of packing for you. If you are doing the packing yourself, we have knowledgeable technicians to help you decide your boxing needs. Rent your own truck and we’ll send the helping hands and backs to load and unload your truck. We think that short distance moves are best for Hybrid Moving. For long and short distances, moving truck rentals may seem more economical than hiring professional movers, but make sure to include factors such as moving truck costs, tolls, gas, lodging, food, missing days from work, and the like. At first glance, it may make more sense to you to do all your own packing and moving when you need to relocate to a new home — whether in the same town or in another state. After all, the DIY approach is generally more cost-effective, but, after you consider all the factors, it might actually make more sense to hire a professional moving company. For starters, if you move yourself, you might not have to pay movers, but you will be responsible for paying for moving truck rental as well as gas and tolls — plus lodging, food, and miscellaneous expenses along the way. That also doesn’t take into account the physical toll of all that hard work! Even if it seems a lot more expensive to hire professional movers, it’s important to be honest with yourself about the true cost of moving yourself. Peace of mind is another benefit of hiring a professional moving company. 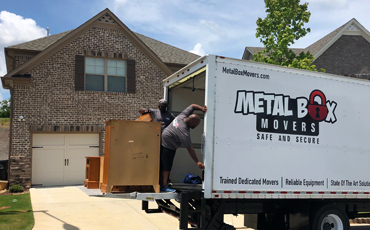 Having experienced and well-trained movers pack and unpack your things can be a great source of peace of mind, especially when it comes to handling large furniture, major appliances, and fragile items that need to be handled with extra care so as to avoid damage. A company that offers professional moving services can handle your more tricky-to-pack belongings with skills that come from years of moving. If any of your items are damaged during your move, despite our best efforts, or if items get lost in transit, it’s the moving company’s responsibility to pay for repairs or replacements — not yours. When you move yourself, you bear those losses yourself. So whether you self-move or hire professional movers depends not only on what your moving budget is, but also how much risk, stress, and physical labor you can deal with. Whatever you choose, we wish you good luck with your move! Our approach is collaborative and our aim is to be the best stewards of your items. 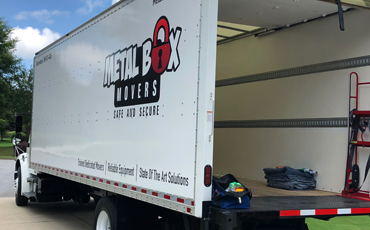 We say, “If it’s important to you, it’s a priority for Metal Box Movers.” We do this by immersing ourselves in your move, and by offering expertise and moving services that are tailored for your personal moving needs. If you’re ready for a safe, dependable, and affordable household mover, just give us a call or fill out the form below!